Bill Paxton is an American television and movie actor. He has appeared in a number of films including Apollo 13, Aliens, and Titanic. 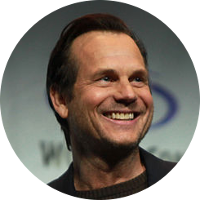 In 2012 Bill Paxton received an Emmy nomination for Outstanding Lead Actor in a Miniseries or Movie for his portrayal of Randall McCoy in the History Channel miniseries The Hatfields and McCoys. In 2015 Bill Paxton appeared in the History Channel miniseries Texas Rising in which he portrayed his not too distant cousin Sam Houston. Bill Paxton is related to a number of people who had a significant impact on American history. These include American Red Cross founder Clara Barton, Texas Independence hero Sam Houston, and Revolutionary War heroes Ethan Alan and Nathan Hale. He also has a kinship to the current royal family through Princess Diana and her son Prince William. Fellow celebrity cousins include Lucille Ball, Glenn Close, Brooke Shields, and Oliver Platt. Confederate General Elisha F. Paxton was the 2nd great-grandfather of Bill Paxton. In the Spring of 1863 he was killed at the Battle of Chancellorsville while leading the famous Stonewall Brigade. General Paxton died the same night that General Stonewall Jackson was mortally wounded by friendly fire. John Allen was the 7th great-grandfather of actor Bill Paxton. On September 18, 1675, John Allen was among those killed by Indians at what is known as the Battle of Bloody Brook near South Deerfield, Massachusetts. The Indians, led by a Nipmuc war chief named Muttawmp, ambushed a wagon train carrying the harvest from Deerfield to Hadley. The Indians killed at least 40 militiamen who were escorting the wagon train and 17 teamsters. Samuel Bartlett and Rebecca Kibbe are the 6th great-grandparents of Bill Paxton. There are numerous online family trees that claim to know the parentage of Samuel Bartlett. Investigating each of these has so far resulted in each one being proven incorrect. At this point, his parents have to be considered unknown until some valid evidence comes to light revealing who is parents really are.